The Osher Lifelong Learning Institute (OLLI) at Hampton University is a membership-driven organization offering non-credit courses to mature adult learners 50 and older. OLLI's affordable adult education courses cater to life-long students who want to improve their skills, explore new ideas, and interact with interesting peers in their community. Since the 1990s, the Lifelong Learning Institute, sponsored by the Osher Foundation, has created accessible and innovative learning environments with special focus on participants 50 years of age and over. Learners from all backgrounds and educational levels enjoy the benefits of continuing their education through OLLI membership. Choosing from a diverse collection of courses, learners can create their own personal development program, expand their views of the world and enrich their lives and communities. In addition to the Hampton University, Virginia location there are 119 Osher Lifelong Learning Institutes (OLLIs) spanning all 50 states and the District of Columbia. Each is an independently operated lifelong learning initiative of its host-college or university, and is supported in part by The Bernard Osher Foundation. OLLI's network formed progressively over a period of nearly 15 years, beginning in 2001. As of November 2015, more than 151,000 people nationwide are members of Osher Lifelong Learning Institutes. Through satellite locations or partner organization locations, the 119 OLLIs offer courses and activities in nearly 300 individual cities and towns throughout the U.S.
OLLI at HU offers a variety of exciting and stimulating non-academic courses throughout the year. Attending classes at OLLI provides the opportunity to learn new things, make new friends and be in the company of like-minded mature adults. OLLI at HU believes that learning should be fun and relaxed. Our members have a common passion for learning and are encouraged to share their experiences and expertise. Our curriculum committee is dedicated to providing excellent educational opportunities for the adult learner. Responsive to the requests of our members, OLLI's course offerings are always in demand. Classes are taught by experienced HU faculty, retired professors and professionals. Hampton University is proud to be a member of the Osher Lifelong Learning Institute. There are two ways to enroll, by mail or online. By mail you can print and fill out the Membership Form send it in, or you can register for courses and pay dues online. 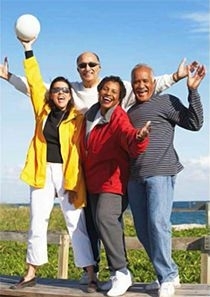 Our members spend their golden years living their lives to the fullest. Life is never boring when you are a member of OLLI at HU. Our program offer educational and cultural activities specially to meet members’ needs and interests. These activities are an integral part of OLLI’s programs, providing opportunities to learn and socialize outside the classroom. Members attend concerts, plays, and sporting events; tour museums and historic sites; and take trips to cities both near and far. Trips to museums, historical sites and uniquely Virginia places are arrange for a low cost. to the Osher Lifelong Learning Institute which keeps the good works of the program thriving each year. or group together with friends to pool your resources. Your support of a faculty chair will ensure that the program can hire and maintain the best faculty possible for lifelong learning. Involve your clubs and service organizations. Do you belong to a service club or organization that could fund a faculty chair or provide a gift for the Institute and help assist the program? Call us! We can help you present the program and speak to your group. An endowed gift is one that lasts a lifetime. Creating an endowment in your name (or a loved one's name) is similar to placing funds in a savings account and providing the Institute with the interest from your gift. Your investment (or principal) is never expended, but the income from the gift is used to assure a lifetime of support for the program. Help us outreach to businesses. Do you know of any businesses that would like to help sponsor the Osher Lifelong Learning Institute? Introduce us ­ we have a complete program to engage businesses and expose them to our program through special benefits and amenities. Contribute to a student scholarship fund. The Lifelong Learning Program has been fortunate to receive generous scholarship commitments, and will always be in need of continued support. There are four easy ways to register to become a member of the Osher Lifelong Learning Institute. Click here to download a registration form (PDF). Complete the form and return it to our office along with payment information. Call 757-727-5434 with MasterCard/Visa information Monday through Friday, 8:00 a.m.–5:00 p.m.
Fax completed registration form 24 hours a day to 757-728-4175 with MasterCard/Visa information. Bring your completed registration form to the W.O. Lawton Building 1006-G, Settlers Landing Road second floor, Monday through Friday, 8:00 a.m.–5:00 p.m.